You know those days when it’s gray outside, you’ve been awake – for no reason! – since 4 a.m., and your couch is all the more comfy due to those factors? That was Wednesday morning, the same day as the preview of the Korean Café at Whole Foods Foggy Bottom. But instead of curling up with the dog on the sofa for a nap while the baby slumbered peacefully in his crib, I got my husband to watch the kid, and I ran out the door. Boy, am I glad I did. At first, I feared kimchi. All Korean food, actually. You lost me at “spicy fermented cabbage.” How foolish was I. One evening, my kind Korean neighbors brought over a feast that included bulgogi and kimchi. I was so delighted by the tastes! I couldn’t wait to try more! Little did I know, an invite from Whole Foods would be delivered to my inbox in a few short days with an opportunity to try their new Korean offerings. 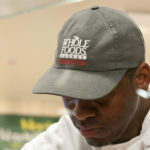 As Prepared Foods Team Leader, Keith Gross, a native of Southern Maryland and self-taught cook who trained at the Art Institute culinary school, said he was dreaming up ways to get more people into the store. 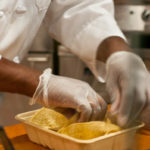 With the area’s college campus and related patrons in mind, he thought about tacos, but how to “take them to another level?” Anyone can serve up an ordinary taco, but he wanted to put a spin on a food that Millenials are familiar with, yet challenge their taste buds. And then it hit him: Korean. 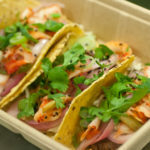 Tacos (3 per order) – $7.00 – Bulgogi Beef, Spicy Pork & Tofu with pickled red onions, green onions, kimchi, green cabbage, cilantro, sesame seeds, gochujang (Korean chili sauce) and Sweet Soy Sesame Aioli. 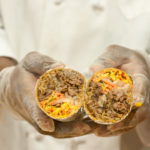 Burrito – $7.00 – Choose Bulgogi Beef, Spicy Pork or Tofu with same accents wrapped with cheddar cheese in a chili tortilla. 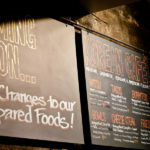 Katsu – $8.99 – Breaded and fried pork or chicken over brown rice, sautéed cabbage and Katsu sauce. 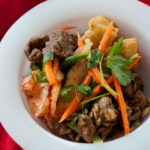 Bowl – $8.99 – Choose Bulgogi Beef, Spicy Pork or Tofu over brown rice, kimchi, green onions, carrots and cilantro. 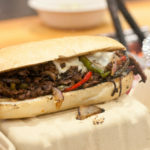 Bulgogi Cheese Steaks – $7.99 – Choose Beef Bulgogi, Spicy Pork or Sweet Chili Chicken sautéed with peppers and onions on a toasted hoagie roll with mayo, gochujang and provolone cheese. Fries – $6.99 – French fries topped with Beef Bulgogi, Sweet Soy Sesame Aioli, gochujang, green onions, cilantro and sesame seeds. The final three dishes seemed the most compelling. I tasted the bowl with beef, pork and tofu. The pork was my favorite for flavor and texture, and though I am staunchly anti-tofu (give me meat or give me death! ), it was decently flavorful and a good option for vegetarians. This kimchi is for people who think kimchi is too spicy; it’s definitely mild compared to what you’ll find at H Mart, for example. 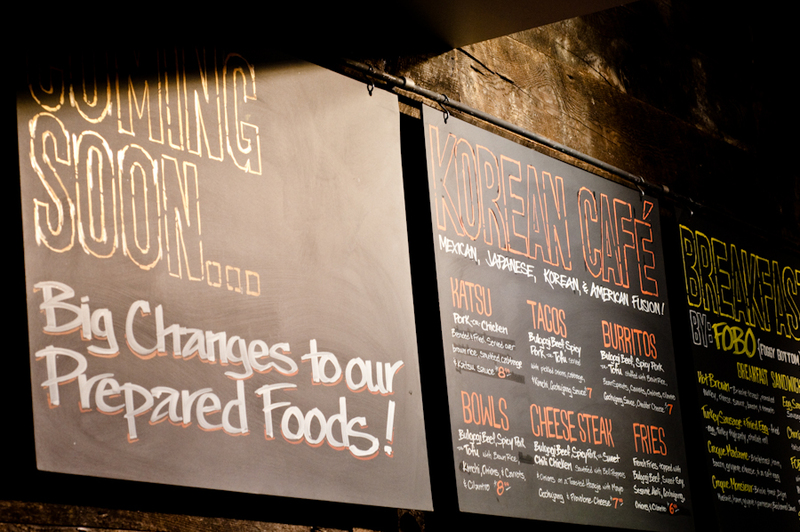 As Gross noted about the Korean flavors in his menu, “it’s not about being spicy,” it’s about enjoying robust flavors. The brown rice is used because it’s a healthier option than white rice, and honestly, if he hadn’t mentioned it was brown rice, I never would’ve guessed. Finally, the fries he calls a “crowd pleaser.” He loves to put fries on his hamburgers, so why not put beef bulgogi on French fries? Cook rice according to package. This recipe is perfect for leftover rice. I used some fancy Forbidden Black Rice that I found at Whole Foods for $3.39/pound and made it in the rice maker with 1 cup of rice to 1 ½ cups of water with a little salt and oil added to the mix. In a skillet, cook some diced onion and kimchi until the onion is translucent. Add diced garlic and cook about 30 seconds, until fragrant. Toss in the rice to warm it up. How’s that for quick and easy? 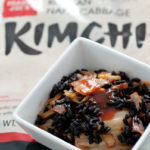 The kimchi I used tasted a lot like similar varieties found at Korean grocery stores and the 10.6-oz. package cost just $1.99. Keep this dish vegetarian or add meat, such as leftover bulgogi. Add in other veggies, too, for a more nutritious dish. What’s your favorite type of Korean food?